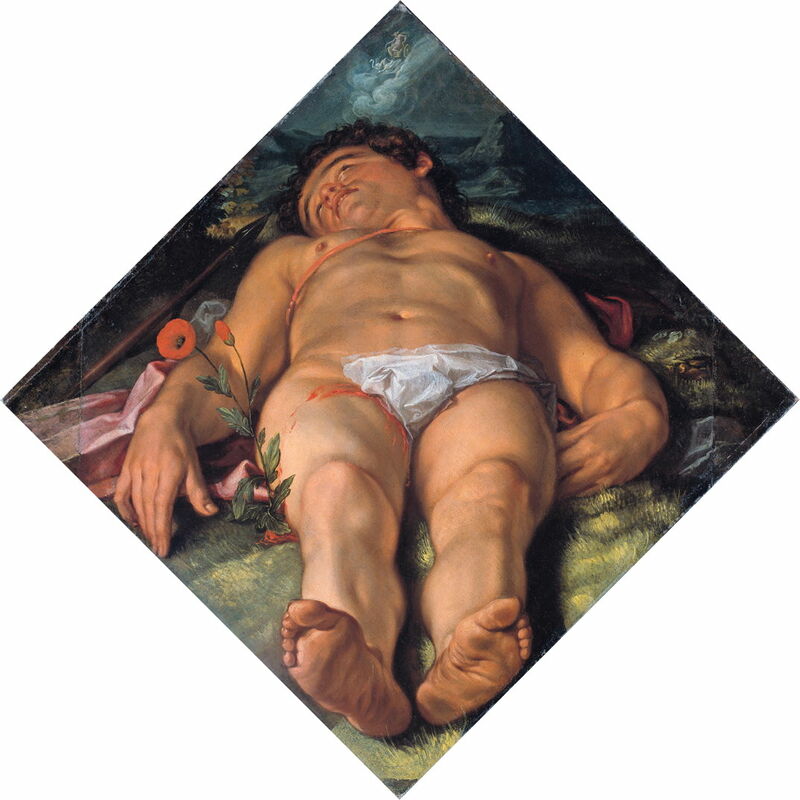 Hendrik Goltzius (1558–1617), Dying Adonis (1609), oil on canvas, 76.5 × 76.5 cm, Rijksmuseum Amsterdam, Amsterdam, The Netherlands. Wikimedia Commons. In the last article, I looked at the history of human exposure to colour, which differed greatly according to class. I turn now to some of the most remarkable changes of all in the history of human visual experience, which have been essentially universal and regardless of class: those of the form of the world about us, as perceived in static views. The human eye is a remarkable optical instrument, but determines little about how we actually perceive the world around us. The job of turning the finely granular images sensed by specialised rod and cone cells in our retinas, into 3D full-colour reality is accomplished by large, specialised, and highly evolved areas of the brain. And our brains have some fixed ideas about the way they do that. One way to gain insight into the differences between the optical reality of the world, and our perception of it, is to look at illusions. I’m not going to drag you through a library of such illusions, but show just one, which has puzzled people for more than two and a half millenia, when it was first discovered. On a clear night with a fairly full moon, observe that moon on two occasions: once when it is only just above the horizon, and again when it is high in the sky. You will notice, as everyone does, that the moon appears much larger when it is close to the horizon than when it is well above it. But we know that the distance between the earth and moon will have changed very little indeed between our two observations, so the actual size of the moon remains the same. Even when you know the illusion well, it is inescapable. I still look at views of the moon low in the sky using my camera, annoyed that the moon never looks as wonderfully big on its LCD display. It is also an illusion for which painters have tried to compensate, striking a balance between the perceived illusion, and their measurements in reality. Some have painted the illusion, usually when making quick plein air sketches. Samuel Palmer (1805–1881), The Harvest Moon (c 1833), oil on paper, laid on panel, 22.2 x 27.6 cm, Yale Center for British Art, New Haven, CT. Wikimedia Commons. 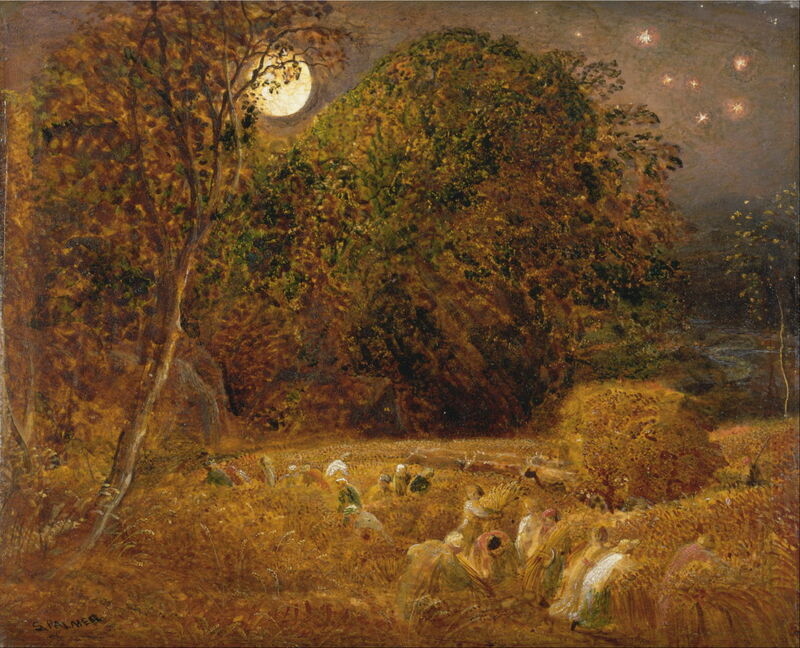 Some of Samuel Palmer’s early works show this very clearly, as in The Harvest Moon (c 1833). 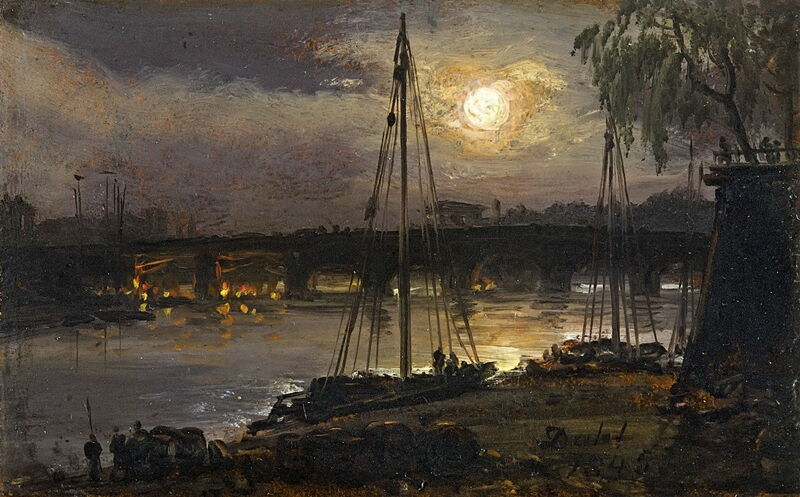 Johan Christian Dahl (1788–1857), Dresden at Night (1845), oil on cardboard, 7 × 11.3 cm, Private collection. Wikimedia Commons. JC Dahl’s tiny plein air oil sketch of Dresden at Night painted in 1845 also shows a remarkably large moon. 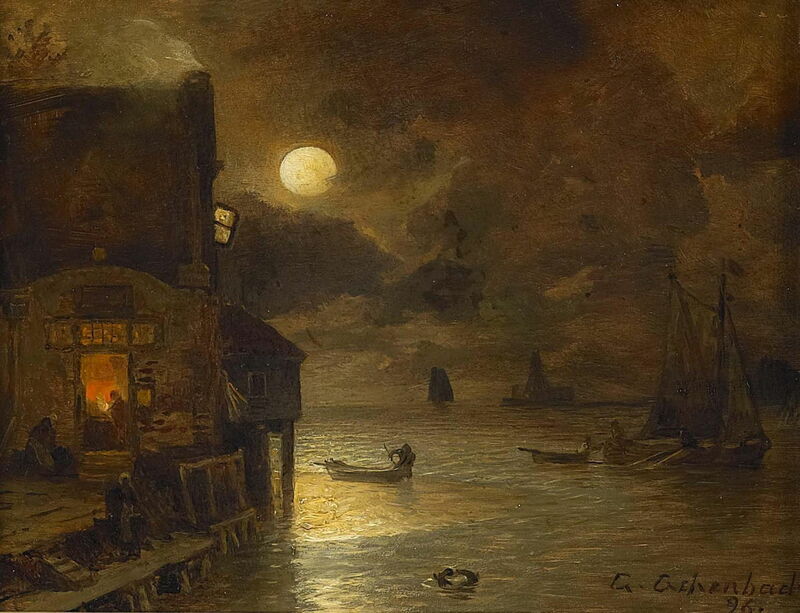 Andreas Achenbach (1815–1910) Night of a Full Moon at the Quay (1896), oil on panel, 23.5 × 31 cm, location not known. Wikimedia Commons. I suspect that Andreas Achenbach painted his Night of a Full Moon at the Quay (1896) in front of the motif, and under the illusion. Anna Ancher (1859-1935), Moonlit Evening. 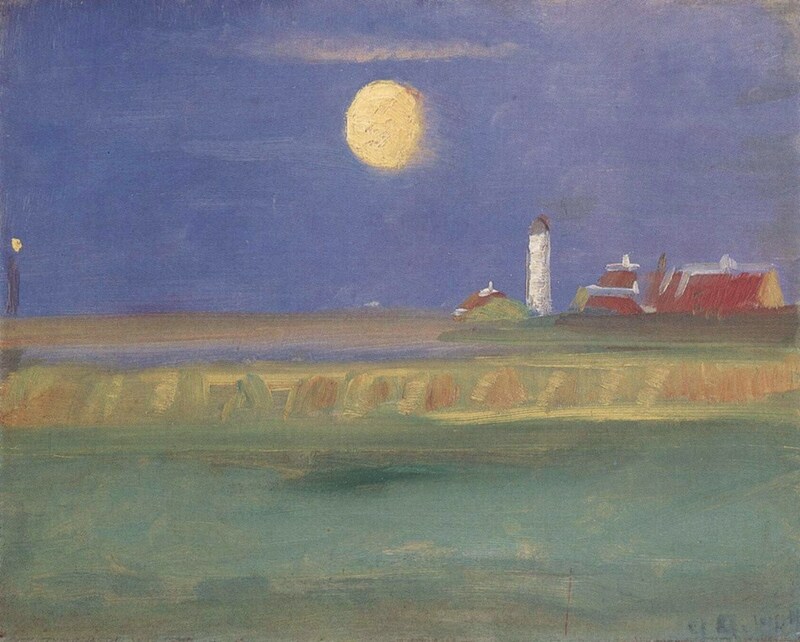 Lighthouse (1904), oil on cardboard, 23 x 28 cm, Location not known. Wikimedia Commons. Even as photography was becoming widespread, amid controversies between the veracity of painting and photography, Anna Ancher sketched Moonlit Evening. Lighthouse (1904) by the light of its enormous moon. It is when the images in our mind’s eye confront those produced by optical instruments, including photography, that disparities between our perceptions and the physical world become most obvious. Looking at the world without any optical aids, visual perception in the brain is quite unlike image formation in cameras or other man-made systems. We actually look at small areas at the centre of our visual fields, which move around constantly as our eyeballs move, in saccades. Away from those central areas, we can perceive form, colour, and movement, but to a lesser degree. Our brains assemble all the fragments of detail into the whole mental image according to various rules – a bit like a modern camera stitching together views electronically into a panorama, only at a far greater level of complexity. Some of the earliest devices made by people which started to break those mental rules were the camera obscura and the telescope. The former casts a photo-like image onto a surface in a darkened box or room, the latter magnifies a small part of our visual field into an image containing detail which we cannot otherwise see. The task of the representational visual artist is to make a two-dimensional image which the viewer is going to recognise as some form of meaningful reality. The more the painted image rings true to the viewer’s perception, the more positive the aesthetic response. So the really skilled painter isn’t trying to create a precise 2D representation of reality, but to make an image which will be perceived by the viewer’s brain as being very close to an equivalent perception of reality. This is an important distinction which photographers have often failed to recognise. More succinctly the painter’s task is to paint a perfect mental image in the viewer’s mind, not a perfect optical representation of the physical world. With the advent of optical instruments like the camera obscura and telescope, visual perceptual experience started to change, and that has changed the goal of the painter. A simple demonstration of one impact of optical instruments on painting is in Frederic Edwin Church’s very large canvases which are packed with fine details. Viewers were advised to come to see them suitably equipped with binoculars (‘opera glasses’ at the time), so that they could marvel at those details, just as they used the same instruments to inspect the appearance of performers on the stage, or horses racing. 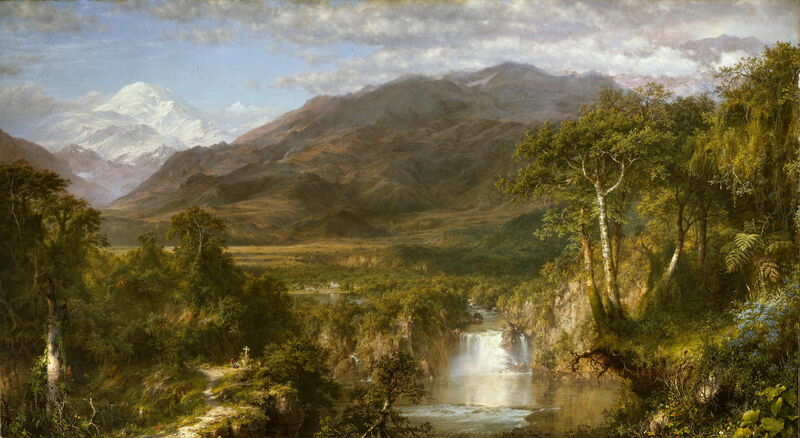 Frederic Edwin Church (1826-1900), The Heart of the Andes (1859), oil on canvas, 168 x 302.9 cm, The Metropolitan Museum of Art, New York, NY. Wikimedia Commons. 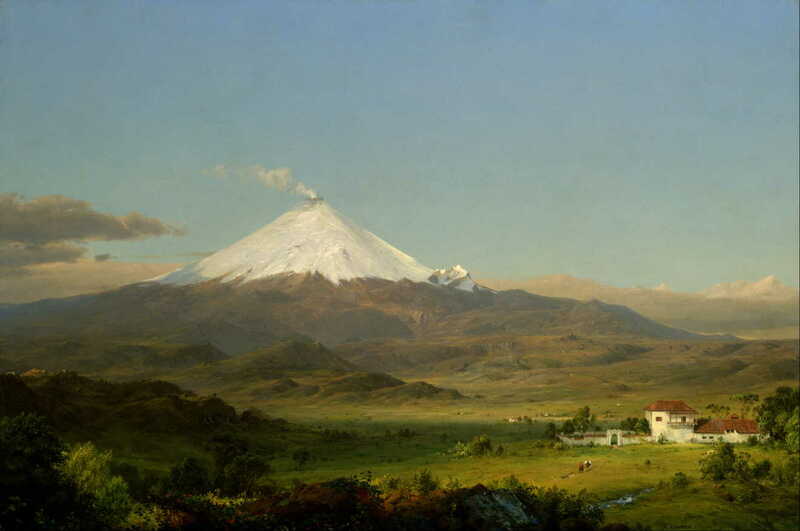 Church’s The Heart of the Andes (1859, above) was the prime example, which went on show in a special display to facilitate viewing by crowds through their binoculars. Frederic Edwin Church, Cotopaxi (1855), oil on canvas, 71 x 106.7 cm, Smithsonian American Art Museum, Washington, DC. Wikimedia Commons. Humans have extensive visual fields, but observe big, panoramic views by assembling many smaller detailed areas. That assembly proceeds according to rules which preserve, among other things, the forms of the objects which we see. When we look directly at a tower, for example, and observe (as we expect) that its sides are parallel and vertical, that form is preserved in our perceived panorama. Giovanni Battista Lusieri painted just that in A View of the Bay of Naples (1791), with its consistent verticals, and absolutely level horizon. The result matches our imagined perception, and we experience it as ‘breathtaking’. The same is true of Théodore Rousseau’s panorama below, with each of its trees near-vertical, no matter what their position on his canvas. Théodore Rousseau, Vue panoramique sur l’Île-de-France (Panoramic View of the Ile-de-France) (c 1830), oil on canvas, 22.1 x 75.9 cm, The National Gallery of Art, Washington, DC. Courtesy National Gallery of Art, via Wikimedia Commons. Because images seen in a camera obscura resemble photographs taken through a relatively tiny lens, their geometry is quite different from that of human visual perception. To show this, I compare some paintings of Piazza San Marco in Venice, with its high tower, with photographs of the same view. Canaletto (Giovanni Antonio Canal) (1697–1768), Piazza San Marco with the Basilica, Venice (c 1730), oil on canvas, 76 x 114.5 cm, Fogg Museum, Cambridge, MA. Wikimedia Commons. This work by Canaletto, painted when he was in his early thirties, is a classical view from the far end, opposite the tower and basilica. Its verticals are all vertical, and the whole view conforms to the rectilinear model in his mind, which he shares with the viewer. 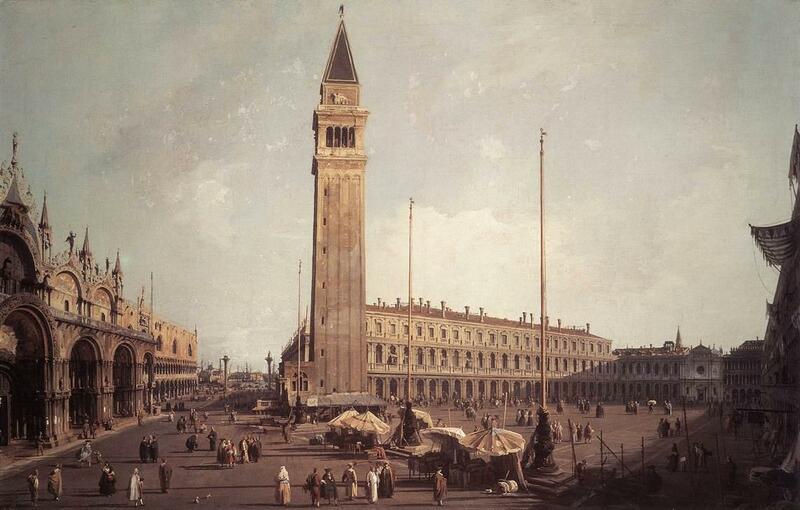 Canaletto, Piazza San Marco: Looking South-West (1755-9), oil on canvas, 67.3 x 102 cm, Wadsworth Atheneum, Hartford, CT. Wikimedia Commons. 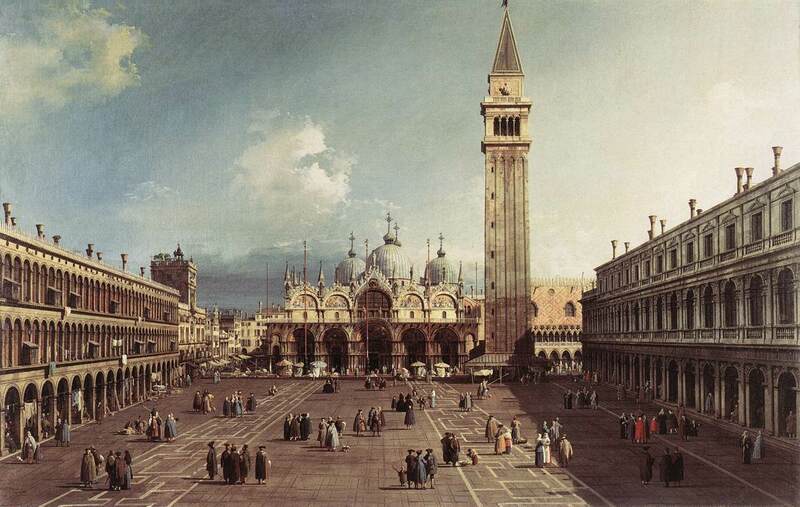 In this painting, Canaletto has experimented with his view, perhaps as a result of his experiments with a camera obscura. Seen from the top corner by the basilica, he has compressed a view wider than a right angle into his canvas, which has resulted in distortion of the angle of view. But every vertical remains meticulously vertical – something that he could not have seen in a similar image in a camera obscura. 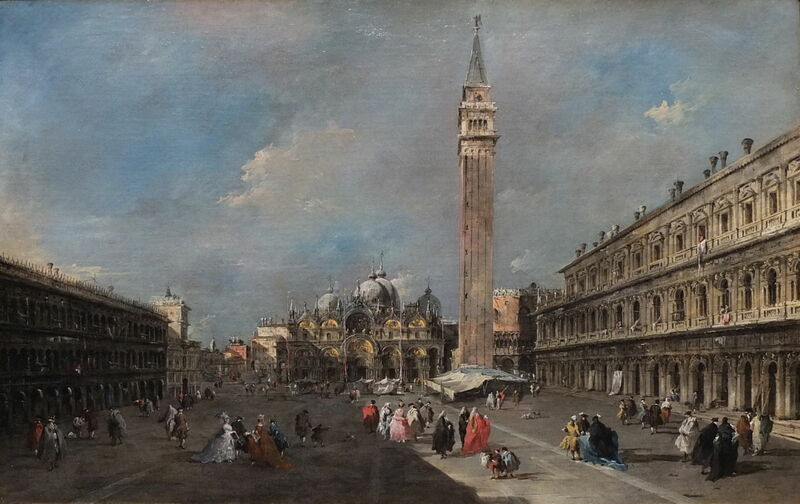 Francesco Guardi (1712-1793), The Piazza San Marco, Venice (c 1775), oil on canvas, 55.2 x 85.4 cm, Scottish National Gallery, Edinburgh. By Ad Meskens, via Wikimedia Commons. Francesco Guardi’s classical view painted in about 1775 maintains the rectilinearity shown by Canaletto. Carlo Naya (1822-1881), Venice, Saint Mark’s Square (date not known), photograph, further details not known. Wikimedia Commons. 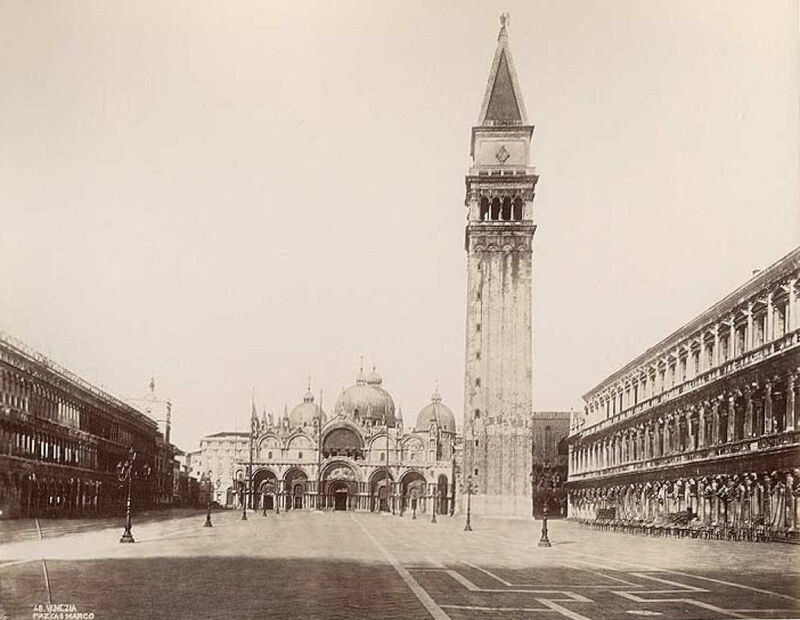 Carlo Naya’s photograph of Venice, Saint Mark’s Square taken most probably between 1870-80 didn’t use a modern wide-angle lens, but is similar to the classical artists’ view, except that its verticals are not uniformly vertical. To see this better, I have selected two much more recent photographs of the piazza. 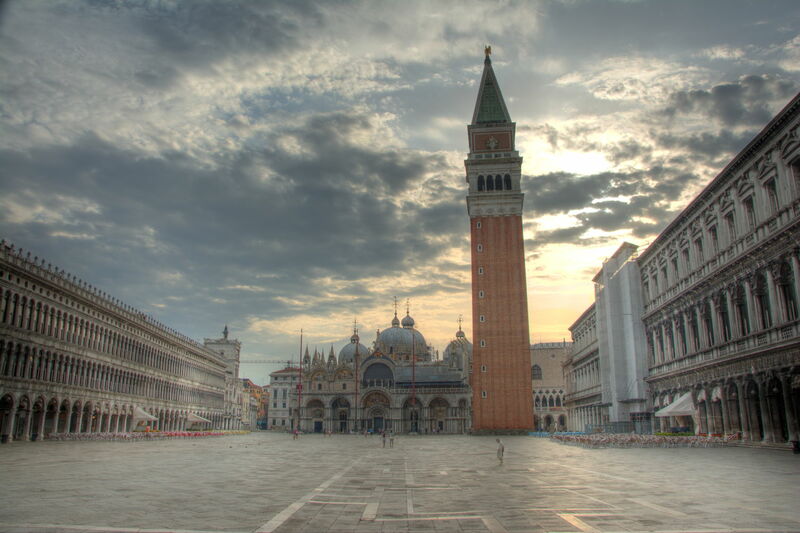 Gian Luca Bucci, Piazza San Marco, Venice (2014), photograph, Panasonic DMC-SZ1, 1/1,600 sec, f/9, 4.5 mm lens. Wikimedia Commons. Loss of rectilinearity is very clear in Gian Luca Bucci’s photo of Piazza San Marco, Venice using a wide-angle 4.5 mm lens. In the version below, I have added precise vertical guides in red. These show how far from parallel are the sides of the tapered tower, and how the buildings at the sides appear to lean into the square. 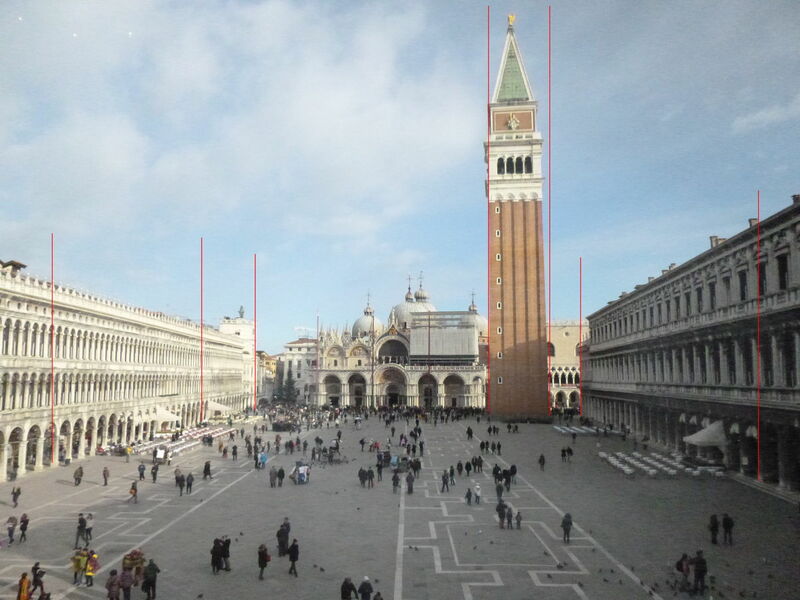 Gian Luca Bucci, Piazza San Marco, Venice (additional lines in red) (2014), photograph, Panasonic DMC-SZ1, 1/1,600 sec, f/9, 4.5 mm lens. Wikimedia Commons. Ramon Espiña Fernand, Piazza San Marco, Venice (2016), photograph, Nikon D7100, 39/12,500 sec, f/9, 18 mm lens. Wikimedia Commons. The optical distortion of wide-angle images is even more apparent in Ramon Espiña Fernand’s photo of Piazza San Marco, Venice with an 18 mm lens. Long before photography introduced human perception to the optical distortion of wide-angle views, people saw blurred areas in images for the first time. Because of our visual processing system and its emphasis on the high detail of central areas in the field of view, blurring in human vision is confined to abnormal sight – the result of refractive errors in the eye (increasingly corrected by spectacles), or abnormal states such as drunkenness and disease. Circumstances in which blurring would be common in photographic images were those in which humans perceived sharp images. A good example is with extreme foreshortening of objects, particularly the human figure, as shown in Hendrik Goltzius’ Dying Adonis (1609). For the painter, such images were demonstrations of their mastery of perspective projection, and Goltzius’ achievement here is particularly impressive. For the photographer, some or much of the image would be blurred as a result of limited depth of focus. In recent years, photographers have made such blurring an artistic technique in its own right – bokeh – control over which is now an important feature in the digital cameras built into high-end smartphones. In normal human visual perception, it is essentially unknown. 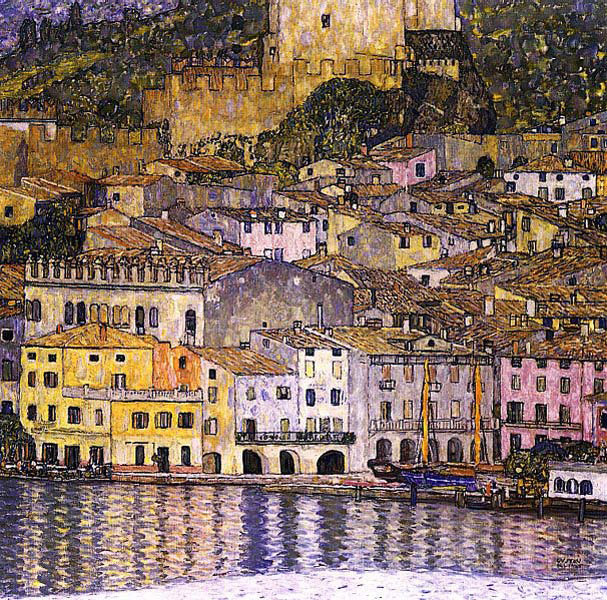 Gustav Klimt, Malcesine on Lake Garda (1913), oil on canvas, 110 x 110 cm, destroyed by fire in 1945. WikiArt. The other common effect in optical devices which human visual perception lacks is the flattened perspective seen in telephoto images. This has appeared in various paintings from the late nineteenth century onwards, such as Gustav Klimt’s Malcesine on Lake Garda (1913), which was probably painted from the images he saw through a telescope. Human visual perception produces a mental image of the world which is quite different from those generated by optical devices such as the camera obscura, telescopes, binoculars, and cameras. Before the nineteenth century, few humans had any experience beyond that of their own mental images. During the nineteenth century, humans gained increasing experience of the images produced by optical devices. Wide-angle views and panoramas included distortion, telephoto views lost depth, and many views developed blur. Some objects persistently perceived by humans in one way – such as the moon being larger when closer to the horizon – were shown to be but illusary. By the twentieth century, photographic images were widespread in most European and North American societies, and increasing numbers were taking their own photographs. By the middle of the century, those groups were being inundated daily with photographs, and by the end of the century all ages, from the youngest children, were bombarded by still and moving images for many of their waking hours. We have no idea what effect any of this has had on human visual perception, but it has been a huge change in our visual experience. In the next article, I will consider movement, both the effects in still images of moving subjects, and the effects of moving images. Posted in General, Life, Painting, Technology and tagged Achenbach, Ancher, Canaletto, Church, constancy, Dahl, Goltzius, Guardi, history of painting, illusions, Klimt, Lusieri, moon illusion, painting, Palmer, panorama, photography, Rousseau, vision. Bookmark the permalink.